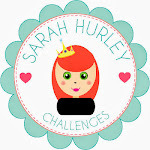 Sarah Hurley 365 (Formerly Sarah Hurley Challenges): Sarah Hurley Challenge News! Today I'm popping in to share some news with you, after much thought and consideration, I have decided that after 4 years, this will be our very last monthly challenge. We've had such fun running the challenges, meeting lots of new people (some of whom became part of my team and all of whom became friends, colleagues and people who's blogs I enjoyed visiting!) My little business has grown beyond my wildest dreams and has done so very very quickly, in that time I have learned a lot about what you are all looking for, what you (and I!) need and how myself and my team can provide that for you. As you know we changed the name of the blog and how we work, a little bit, earlier this year and this will be a continuation of those changes. We hope you will stick around here on the Sarah Hurley 365 blog as it will be filled with inspiration and projects as well as some exciting new features and areas that my team are currently hard at work on! You'll see a gradual change here between now and the first quarter of 2015 as we implement our new plan and I hope you love what we have in store for you as much as I do! I'd like to thank every single one of you who has entered a challenge over the last 4 years, I hope you will continue to share your work with us here and over on my Facebook page (we still like to see what you're up to and look for new people for future projects!) and we still want to hear from you so please do leave us comments on our new projects and plans as we go - it will help us to bring you more of what you want! I'd also like to thank the Sarah Hurley Design Team past and present for all of their hard work in making the challenges fun and inspiring, it's been so fun!